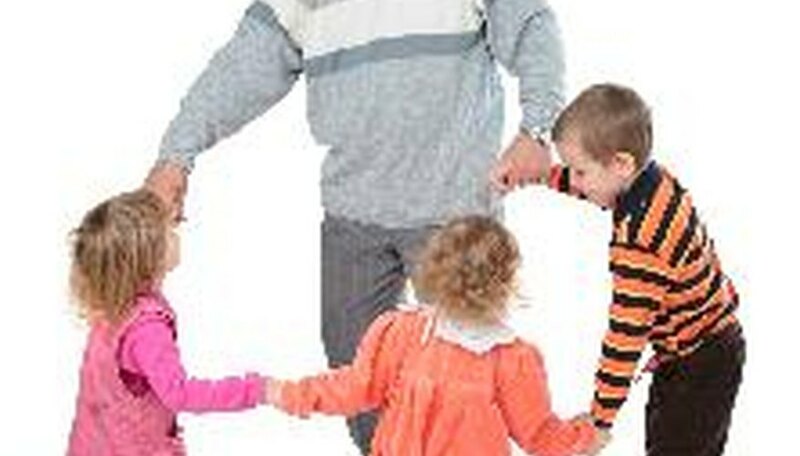 Dance can be a wonderful way for children to learn musicality, coordination and discipline. Keep children engaged and attentive during dance classes by combining technical exercises with expressive movement, musical exercises and games. Adjust these basic lesson plans according to your students' age, ability level and the stylistic focus of the class. Begin your dance class with simple stretches to prepare students' muscles for exercise. Have your students reach all the way up into the air. Add visual imagery by instructing them to try to "catch the sun." Then have them reach down to touch their "tippy-toes." Repeat this stretch several times before sitting down. Show the students how to place their feet together in a "butterfly stretch" and instruct them to flap their butterfly's wings. Have each student take a turn deciding where their butterflies will fly next. When everyone has had a turn instruct them to "shake all the wiggles" out to release their muscles. After stretching, continue warming up with a "circle dance." In addition to helping students recall steps from previous classes (if they have had any) it helps you remember their names. Standing in a circle, begin by saying your name and demonstrating your favorite dance step for everyone to imitate.The student immediately to your right will repeat your name, tell you his or her name, perform your step and add a movement of his or her own. Continue until every student has added a step to your "circle dance." After you have finished warming up, have children make a line on one side of the room. Lead them in a series of movements traveling across the floor. Depending on the style of dance you wish to emphasize, you may begin with "ballerina walks" (walks on tip-toe) or marches. Demonstrate each step and practice it together before allowing students to progress across the floor two or three at a time. As you gauge the ability level of your students, move on to other steps like kicks, skips and gallops. Tailor the steps based on the stylistic focus of your class. If you are preparing your students for ballet study, include more ballet terminology and technique. Reward your students for their hard work by finishing class with a dance-based game or two. Teach children audience etiquette by playing an "performance game." Every student takes a turn "performing" a step she learned in class that day while her classmates practice being good audience members, watching attentively and applauding politely. This game also helps students get used to performing in front of an audience. Next, give children a chance to express themselves by playing "freeze dance." Let students dance however they choose while music plays. Whoever fails to "freeze" when the music stops is "out." The last student standing is the "winner." Many dance classes finish with a bow or "reverence." Have your students stand in a straight line or a circle, depending on your preference. Allow each student to perform his or her own individual bow or curtsy while the classmates applaud. Finally, lead students in a group curtsy or bow. If time allows, you may want to include a basic stretch or two during this stage of class to help students' muscles cool down. Instruct your students to applaud for themselves. If you like, reward every child with a sticker or stamp on her hand.